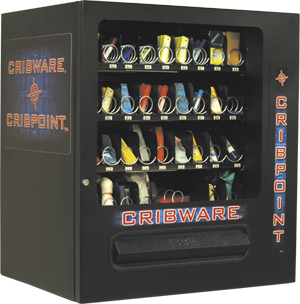 CRIBWARE® CRIBPOINT Vending is a versatile, rugged, low-cost industrial point-of-use dispensing system for safety supplies, cutting tools, welding accessories and other supplies. 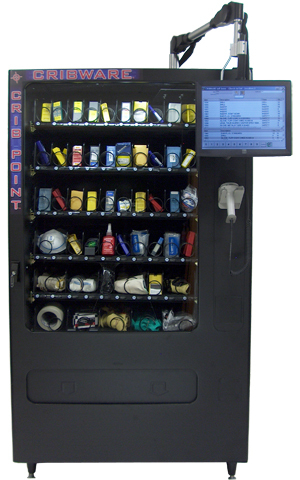 More robust and versatile than consumer-grade vending machines, these units work for you 24 hours a day, 7 days a week! 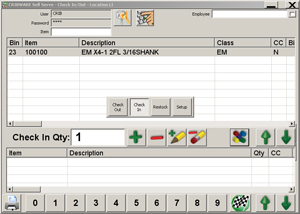 A unique tray design makes reconfiguring the machine a breeze. Helices can be repositioned, exchanged for a different pitch, or even driven in tandem, without tools. Exclusive dispensing aids and adapters enable the issuing of parts with irregular geometry, dramatically reducing the need for repackaging and ensure trouble-free dispensing in even the most challenging industrial environments. A unique easily-reconfigurable helix design provides flexibility that can meet your dispensing needs today and for many years to come. Items can be dispensed individually or as packages. Secure in a rugged cabinet under computer control. The CRIBPOINT activity is monitored, controlled and reported by the CRIBWARE® system. Verified-Vend technology senses when vends are complete and provides an "electronic nudge" when needed, to ensure proper dispensing. A return bin provides space for recycled material or items to be reworked or reground.